Big data analytics identify clinically meaningful factors associated with large patient cohorts. Predictive models, often constructed from big data, provide individualized stratification of risk to inform clinical decision-making and mitigate long-term morbidity. We describe a guiding framework of how to transform large institutional datasets into a real-time, interactive decision-support interface App. Across 3 major academic hospitals in our institution, 558 variables were analyzed from 164,014 encounters belonging to 78,030 patients. Demographics, medical comorbidities, and operative characteristics were abstracted from the electronic medical record using ICD-9 codes. Surgery-specific predictive models were generated using regression modeling and corroborated with internal validation. Using an advanced coding framework captured from multiple clinical settings, all patient and operative variables were weighted according to ß-coefficients generating 8 procedure-specific risk models for incisional hernia occurrence classified by the index abdominal surgery. All demonstrated excellent risk discrimination (C-statistic=0.76–0.89). 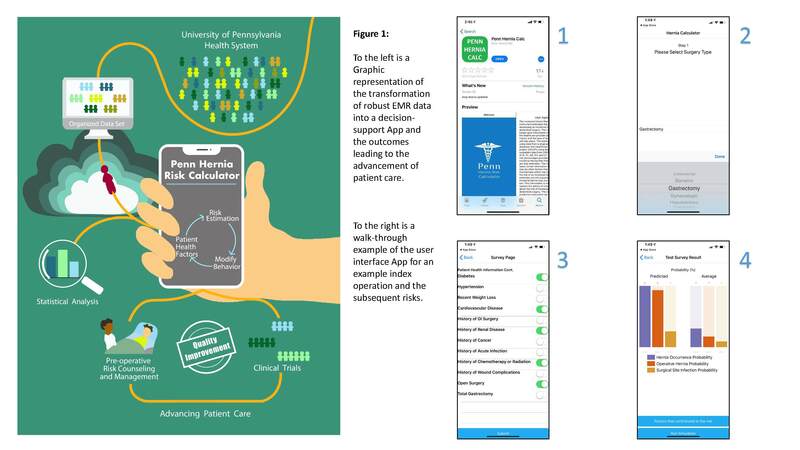 The models were incorporated into a functional user interface website (http://www.pennherniariskcalc.com) and App (iOS/Android "Penn Hernia Calc"). Transformation of large institutional datasets, a combination of administrative claims and long-term EMR chart review, into actionable clinical applications was accomplished by an organized framework and meticulous cross-referencing. The model is proof of concept (Figure 1) arriving at a fully integrated App that surgeons may use for individualized patient counseling, real-time risk estimation, and in designing stratified cohorts for clinical trials.